Looks like every internet security software makers are trying hard to promote their products by offering free keys and various other promotions. Just few minutes back I mentioned about the Kaspersky promotion through which you can get a 9 months Kaspersky antivirus subscription absolutely free. Well, here’s another one. This time it’s a BitDefender promotion. You can get a 120days subscription absolutely free. I’m sure most of you have already heard of Bitdefender, it’s well known. 1. Go to Bitdefender internet security 2009 promotion by clicking here. 2. You’ll find a box. Enter your name, last name, and valid email address in the boxes as shown above. Once done, click on the Send button. 3. 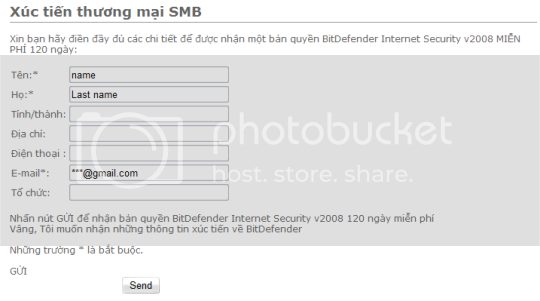 After few minuted you should receive an email with the title ” Xac nhan dang ky ban quyen” in your mail box, It will contain the License key for Bitdefender Internet Security 2009. Copy and keep it safe somewhere so that you don’t forget it. 4. Now download Bitdefender Internet Security 2008 from the below links. 5. Install BitDefender Internet Security, once done restart your computer. Now enter the key which you had got in your email earlier to activate. Be quick people, this offer may expire any moment. The sooner you get the better it is.